Wetlands 4, 2018, oil paint on canvas, 24 x 36 inches. Photo credit David Barbour. The creek and wetlands close to my home are a never-ending source of fascination. I walk there each day to see the on-going changes and surprises that await me. 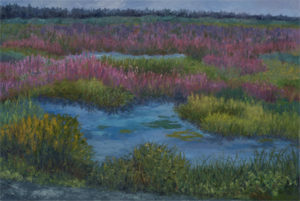 Through my Wetland Series I intend to awaken an awareness of the importance of protecting natural habitats, not only for the wildlife they support, but for our own well-being. All are inter-connected.